It was a scenic route to quite a high elevation in Tagaytay City. Isolated from the city center and major landmarks of Tagaytay, there sits a Swiss-inspired property that goes by the name of Crosswinds Resort Suites. The hotel is situated at the center of this Swiss community. Thus, before one can reach the hotel, we have to pass through the laidback and tranquil community that surrounds the 100-hectare vast property. This is the quiet alpine escape that folks like us in the metro would call as heaven. 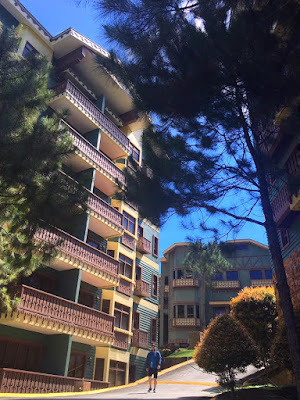 The scent of the pine trees without having to go north, like Baguio City, and the view of the rolling hills makes the hotel a perfect treat for a weekend. The fully-equipped kitchen is actually the best part of what Crosswinds Resort Suites can offer. Guests can cook and bring as much food as they want or even have it delivered without any corkage fee. We were booked in a One-bedroom Suite featuring the fully-equipped kitchen, dining and living room separate from the bedroom. It was indeed spacious. We even converted the living room as our work station for the weekend. There’s also an ensuite toilet and bath, complete with all the complimentary toiletries. The rooms are well-decorated with balconies to provide space for a more relaxed staycation as one views the tranquil surroundings and the lush forest and aligned pine trees. The stay comes with a complimentary breakfast served in a dining and banquet hall across the hotel building. At the second floor is the corporate function room. 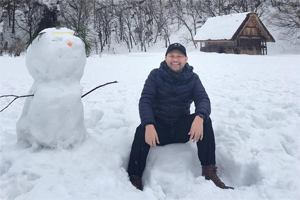 To complete the staycation experience, among the hotels’ amenities are: outdoor swimming pool with kiddie pool, playground, Christmas village and the coffee shop, which is open during the weekends. The best way to go there is through private vehicle but if there’s none, it is still accessible, though proper coordination should be made with the hotel staff, as this is quite far from the main road and there’s rigid security at the subdivision’s main entrance, especially if you are arriving late at night (like our case). From Manila, take SLEX and exit at Sta. Rosa or Eton and go all the way to Tagaytay City. Upon reaching the rotunda, turn left and drive straight ahead by 10 kilometers. The Tagaytay Picnic Grove will be your signal to slow down, as the Crosswinds Resort Suites is 2 kilometers to your left. For guests without private vehicle, shuttle service are available from the gate of the Crosswinds. Advice and proper coordination with the front desk and the hotel staff should be made in advance. Since the property is vast, shuttle service is likewise available to roam around the vicinity. Here’s a map for reference. 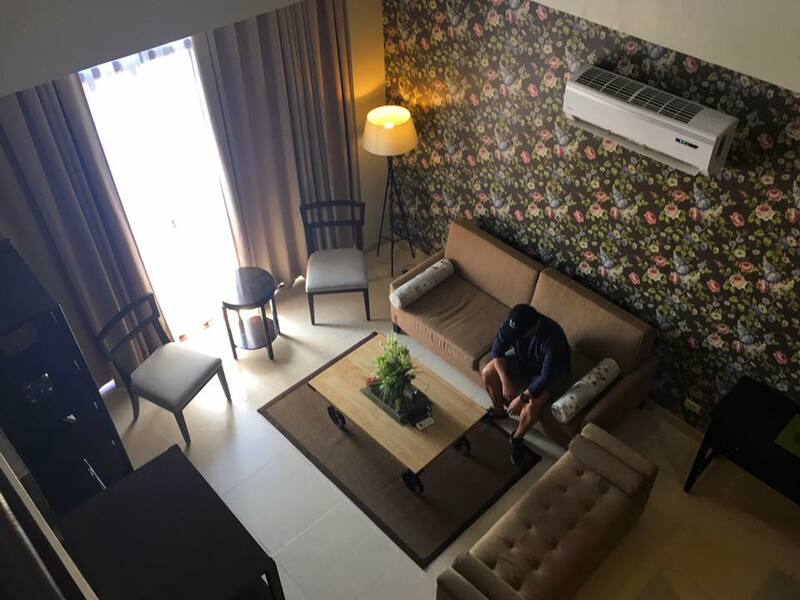 If one intends to just relax while in the comforts of a tranquil community and away from the metro, yet accessible during the weekends and without having to file a vacation leave for work, the Crosswind Resort Suites is the answer. You have to ditch your plans of going around the varied landmarks of Tagaytay City as the property is quite isolated. It is better to just stay in the hotel or roam around the community especially during the summer season. 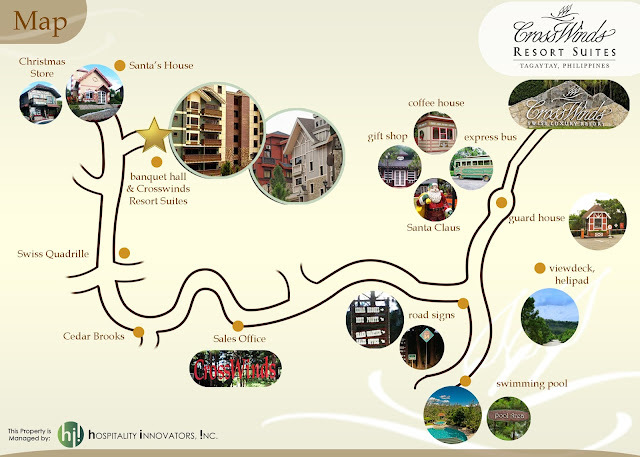 The resort is perfect for a weekend bonding with your loved ones.